With the hot humid weather stretching across the United States one defect to keep your eye out for, when inspecting onions, is Black Mold. You will find this defect on all types of onions, northern grown onions, Texas onions, yellow onions, red onions, jumbo onions or pre-pack onions. The USDA Inspection Instructions state: The indication of this disease is the presence of black, powdery spore masses of the fungus between the outer fleshy scale and the adjacent papery scale or between the layers of papery scales. The spore masses are usually heaviest around the neck of the onion and have a tendency to follow the veins down the sides. On onions with thin or light papery scales these spore masses are usually visible through the scales. 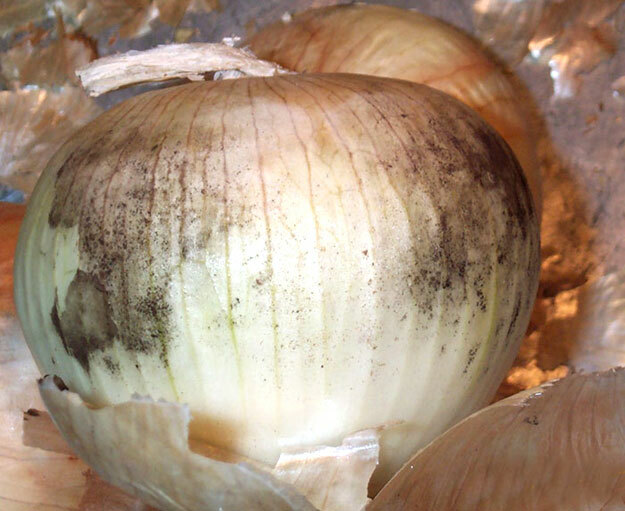 Onions that have black mold between the scales are very susceptible to Black Mold Rot. The point worth noting from the USDA…..the scales affected by Black Mold are very susceptible to Black Mold Rot. Black Mold Rot is a decay, that can be detected by swiping your finger over the Black Mold and if the tissue disintegrates, the Black Mold has now progressed into Black Mold Rot, which will progress, spread on the onion and spread onto adjacent sound onions. If you encounter Black Mold, the US No. 1 Grade allows up to 3/4 inch area on a 3 inch onion. Any amount more than what is allowed is scored as a defect, damage by Black Mold. If you were inspecting northern grown onions the standard allows 5% defects. If the onions were southern onions (BGG type) the standard allows 10% defects. But if the Black Mold has progressed into Black Mold Rot (decay) each standards only allows 2%. And any amount of decay, or Black Mold Rot would be scoreable, as decay is a free from defect. Do you have any information on onion staining (specifically on 1015 onions)? Brian, thanks for the question. Yellow Onions fail to grade when more than 20% of the onions are appreciably stained. Appreciably stained means that there is sufficient staining or discoloration caused by weathering or other means to materially affect the appearance of the individual onion, a judgement call.